I recently decided to venture into the world of lager brewing after making several successful ale recipes. I have a top loading kegerator that I am converting to a two chamber serving and brewing configuration, but was worried about getting my 5 gallon carboy in and out of the fridge because of the lack of handles. Last night, while buying the Edelbock, I decided to buy the Brew Hauler to help me lift it in and out. I went home and started brewing. After a nice afternoon of brewing (boy that wort smelled good) I was ready to eat a late dinner. My roommate was pulling the steaks off the grill and I had just cooled the wort. I picked up the carboy using my new Brew Hauler and started walking to the brewing closet. I hadn’t taken more than five careful steps when I felt a slight tearing or slipping of nylon. Before I could react the carboy promptly exploded on our tile floor. Pieces of glass were thrown clear across the kitchen and my delicious Edelbock rushed to every corner of the floor. Sticky green hop-scented water filled every nook and cranny beneath my fridge, under cabinets, and slowly expanded into the dining room. Luckily everything it touched was tile, and after a few hours of furious mopping our floor is only slightly sticky. We went to bed exhausted. This morning I examined the Brew Hauler. There were no visible rips, tears, or even so much as a frayed thread. The carboy had simply slipped out from the Brew Hauler Harness. I think this disturbed me more than if it had broken. I had carefully ensured that none of the straps were twisted, tightened down the clip harness, and carefully tested it when empty. The Brew Hauler didn’t break, it is simply a faulty design. Maybe it was the bit of wort that spilled around the neck of the carboy and moistened the straps– I don’t know. All I know is that now I’m out a carboy, out a $40 batch of beer, and out the entire 8 hours of my day that I spent producing and then cleaning what ended up being the stickiest floor polish I’ve ever used. I felt cheated. I had bought a $15 Brew Hauler, and it destroyed $75 worth of beer and equipment. Even worse, when I asked AHS about being refunded the cost of the carboy and the beer I was told I needed to write an email to the owner. I may not be a seasoned Austin brewer, but I do feel like AHS is my friendly neighborhood beer store. I recognize most of the employees, and since my friends bought me a starter kit from AHS almost a year ago, I’ve brewed 5 AHS recipes, the most recent (besides the ill fated Edelbock) being the Sunny Oats Ale. 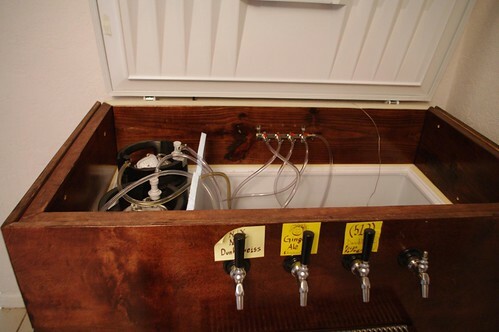 I purchased all the beer lines and CO2 equipment for my four tap kegerator from AHS, and always found their advice to be accurate and helpful. Austin Homebrew Supply’s owner replied to my email within two days and was very understanding. He’s generously offered to replace both the carboy and the Edelbock kit so I get get on with brewing this next weekend. Once again all is well in the world. I think this time I might get a plastic carboy. This post is unpolished, and will probably be evolving as I cement my views on the issue. My real reason for writing this is to organize and record my own thoughts. Initially I was very pro Net Neutrality, and honestly if it were well drafted I could still be for it. The problem is that regulating such a law would be an opportunity for the FCC to introduce all sorts of monitoring equipment into ISP’s networks, and that worries me. I also don’t like the idea of the government telling me what I can and can’t do with my data lines. What if I want to run an ISP that advertises better XBox QoS compared to internet? Does my open wireless network give the FCC the right to come into my home and check my QoS conditions? A lot of the arguments you hear for Net Neutrality seem to think that it will prevent companies from charging high prices or somehow give us tons of bandwidth for the same price. Its not price regulation… I don’t see how this is going to happen. The real problem is that end-customers don’t have enough choices of content providers, which is probably a symptom of there not being enough backbone providers to actually move data around. Unfortunately building a backbone is not cheap, and unlike the Highway system that everyone keeps comparing it to, it was privately funded. Encourage more backbone development by more companies. When everyone is leasing from Ma Bell then Ma Bell is ultimately setting the price and controlling the internet. Enforce not necessarily Net Neutrality, but Net Accountability. This combined with more ISP options would allow customers to identify providers that are damping traffic to/from particular sources. This could be as easy as a trusted 3rd party bandwidth evaluation and “seal of approval”, but there is no incentive for providers to endorse this without some competition. Some days I have nothing to do, but my life never seems to end up dull. Yesterday the only thing I had planned was to attend an REI garage sale that I had heard about only two days before. The night before I nearly talked my housemate Lindsay into joining me since she was going to be at the farmers market just a few blocks down the road, but she decided that she’d rather get two extra hours of sleep rather than wait in line for camping supplies she wouldn’t buy. I showed up at 7am, but was already #75 or so in the line (doors open at 8). By the time I got in, all the climbing shoes were gone. I ended buying a gerber, lightweight snowpants (for riding), and found some 11.5 climbing shoes at the last second. In the store I meet up with Lt Norton, and convinced him to join me and Lindsay at the Farmers market. We all got some jam, and Lindsay bought some delicious spinach and tomatoes that I had in lunch today. Lindsay suggested we get brunch at Taverna, so we chatted for a while, and I was reminded that Norton wanted to go climbing with me sometime. Considering that it was a gorgeous 75° on January 2nd , we headed out to the greenbelt and I bought myself a climbing rope on the way (the only essential piece of climbing equipment that I was missing). After two hours of climbing I was exhausted and came home to take a 2 hour nap on the hammock. By the time I woke up, Lindsay had whipped up a lasagna and I ate 4 generous helpings before we went to have drinks with John Dryden, who was passing through town. We were met by Mike’s sister and friends, and Greg, who convinced us to finish the night at the Parlour with some good pizza, more beer, and few games of pool. I think I got home at 1:30am. A full day! Hello Apron Adventurers! Lindsay was nice enough to ask me to write up a post about the traditional Norwegian flat bread I contributed to our duplex thanksgiving this year, so here it is kids. Enjoy! Part of my family’s tradition for both thanksgiving and Christmas dinners for about as long as I can remember has been the making and eating of Lefse. Lefse originates in Norway, and is about the only thing I can show for my 1/16th Norwegian heritage, but this was the first year I’ve ever attempted to make it alone. It turned out to be pretty easy, but does take a good amount of time and some special equipment. 20lb of potatoes yields roughly 10 and a half batches ( we like to think big ). lefse griddle. A flat variable temperature surface with low edges and at least 12″ diameter. Mine is closer to 24″. lefse stick. A wooden stick thats flat enough to slide under a lefse and about 3/4″ wide, used for moving the dough from the rolling surface to the griddle. 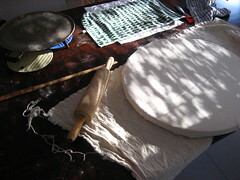 lefse rolling pin. I’ve never seen these used for anything else, its a regular rolling pin with grooves cut laterally down the side. Luckily my mom had a spare. Pastry Cloth. Its hard to find these, but it can be done. I made mine from a thick cotton canvas pulled tight across a flat, heavy piece of wood ( just like my grandma used to ). You need it to be at least as big as your griddle, and the more room the better. Boil and mash the potatoes, mixing in the cream, butter, and salt. This can be done all at once if making multiple batches. Place the mixture in the fridge to cool. You can keep it like this overnight, but I’d throw some saran wrap on it in that case. 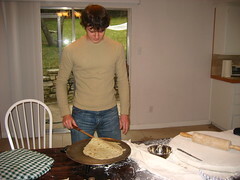 Once the potatoes are cold, heat up your handy lefse griddle to about 475 degrees, and rub flour into your pastry cloth. One batch at a time, add the 1 cup of flour to the potatoes, and make into small fist-sized balls. To keep them as cold as possible, return them to the fridge, taking out one ball at a time. Roll each ball into as thin a lefse as possible before it starts sticking to the pin. This is the tricky part. Cold dough minimizes stickiness, and frequently rubbing the pin and cloth in flour helps as well. In order to transfer the lefse from the pastry board, start from one end and roll it up around the lefse stick, unrolling it on to the griddle. It should cook for about 1 minute a side, enough for golden brown spots to begin to form. When done, place between two moist towels, flipping the pile occasionally. And there you have it! I made 10 pounds of potatoes, and between snacking while cooking, and our 30 guests at thanksgiving, only 3 lefse were left over, so it looks like I’ll have to do it again for Christmas since I had none left to freeze. We typically serve lefse warm or at room temperature (it cools fast…) with butter, with butter and brown sugar, or just plain. I usually roll it up and eat about half a lefse at a time, depending on the size. I hope you enjoy it as much as I do! Ha Det! I am now officially moved in to my new place at Far West. All that really means is that all my stuff is here, since my other lease ended today, but at best half of it is unpacked. We had 10 days of overlap, allowing us to take our time cleaning out the old place. The move was interesting – I rented a 17′ uhaul and moved all our stuff and all the girl’s stuff in two trips. The girls had the opposite problem of moving out 10 days before the next lease started, and so they were couch surfing for a while. Since they are now on the other side of Arvind’s and my duplex, it made sense for them to store their non-essentials in our garage at Bravosite (the name of the old place) until the lease on Shadow Valley started. We are calling our new house Shadow Valley, and trying to stop the girls from calling us the “Shadow Valley kids club”. So far we have been successful in preventing shirts with handprints and “move in day” painting on it… but we can only hold out for so long, since there are 3 of them, and 2 of us. While the actual move went on without a hitch, I seem to be having pretty bad luck since the move. The duplex didn’t come with a washer or dryer, but did have hookups. Rather than renting one I decided it might be wise to go ahead and purchase a pair from craigslist so I can take them with my to my next place. Not two hours after I paid for them, and half way through the second load of clothes, the pump seized up causing the motor to spin in place on the belt producing a sweet burning-plastic scent to add to the aroma of the laundry detergent. After siphoning out the water in the basin, we managed to pull the pump out and order a replacement. Hopefully it will be here soon, and hopefully that was the only problem. The next day, while Lindsay was cooking for us– Side note here: living next to Lindsay of Apron Adventures turns out to be an awesome choice! But as I was saying, while Linday was cooking for us, the stove decided it had had enough of this whole “cooking thing” and wanted some time off. Aparently using the stove was a bit much for the wiring in this house, and it decided to short out in a nice series of pops followed by a slightly familiar burning smell which, for some reason, now makes me think of fresh laundry. My troubles were not over yet, because I discovered the motherboard I just ordered for my new computer came in with a faulty SATA controller. I’m really hoping newegg.com is good with returns to different addresses, since I had it shipped to my old house the first time. Three problems in like 4 days… I had hoped that 3 was the magic number. You know what they say, trouble comes in threes and all. Well, not for me. Yesterday after driving through austin on a particularly hot day, my car decided to start pouring out antifreeze all over my drive way. I’ve since refilled my coolant system, and let my car idle for a few minutes, but didn’t see any leaks. I’m not sure if thats good or bad, since I could at least find the problem if it presented itself again. Don’t tell mom and dad, but I was kinda wishing my entire radiator was busted and I would just have to buy a motorcycle ;-). So in conclusion, Shadow Valley seems to be a great house, with a nice yard and sweet neighborhood. We’ve been watching the doe and two fawns that enjoy feeding in our back yard every morning, and Lindsay’s cooking is far better than what we had been doing on our own. Work is right around the corner and we keep finding new friends that live up in this area, so we won’t be lonely. I’m really just hoping going to work tomorrow doesn’t provide a 5th tally to my list of troubles :-P.
So, Luke hasn’t been around much lately… I thought I’d fill in for a while. I’m bloggy the self writing blog that lives to serve this luke guy. While he went galavanting around Austin I used to sit here waiting for updates from him, but now I’ve decided to take matters into my own hands. 6 months of silence is just too much for me to bear. I know that Luke has been busy rock climbing in the green belt, camping at enchanted rock, hosting movie nights, and generally screwing around…. not to mention working. But couldn’t he take the time every once in a while to sit down and have a little talk with me!? Just a few updates, thats all I ask. He could have written about his climbing harness arriving at REI today, or the planned repair of the water works at his parent’s place in San Antonio this weekend, but instead hes tinkering with his server and trying to play games with a rival house. I swear that new friend of his… whats his name… “twitter” i think? Ya, that twitter guy gets more attention than a nudist at a dinner party. Not to say that I have any problems with nudists, I just don’t think they should be attending– but thats besides the point. Point is I’m going to have to take charge around here and crack the whip to get Luke moving. Otherwise none of his friends will have a clue as to whats happening in his life, I mean its not like he actually talks to anyone anymore… I mean besides the gables girls, and BFD house, and Apartment Land, and his co-workers… and I suppose he did send an email to his mom this morning. Who am I kidding? I’m just his little old blog. So outdated in today’s communication methods, what with facebook and well… you know… face to face conversations and all. We’ll see. Maybe there is hope for me yet. I’ve been working a lot on a research project for one of my Professors which has most recently involved a lot of compiling on an old Sun (we need the 16GB of memory available on it :-) ). I spent literally two days trying to compile omnet++ and the INET suite. I finally managed to get it working after some consultation with the #solaris channel on freenode. Therein lies the problem. I think I’ve just dragged myself into irc by finding the #hamradio channel. I think ham radio is my nerdy guilty pleasure. By idling in that channel I’m finding out all sorts of interesting things, and again reviving this latent desire I have to get a ham license. For now, I may have to learn CW so I can use cwirc: http://users.skynet.be/ppc/cwirc/. This semester has been interesting so far, but I’ve been focusing a little bit too much on my research at the expense of my other classes. I suppose that means I like the field I’ve chosen, so its not too bad… but I need to put some more time into studying for GEO and EE. Last week – Chris turned 21… boat party on lake austin! Chris knows lots of pretty girls. It was a good night. This week – superhero party? This might be interesting. So in our boredom arvind, caroline and I all got Twitter accounts. Since I don’t have any real friends on twitter, I though I might see if there is anyone else who reads this blog and uses twitter. For those of you not familiar with the Twitter application, its basically “micro blogging”. You are expected to update once a day or more, but each update is only 140 characters. Which sounds pretty boring, except that you can blog from your phone while you are out and about, which leads to very random interesting posts. So far we know we will be cataloging all of Mike’s weird quotes, and probably professor quotes as well. (which I already do, just on the side of my notes where no one else gets to enjoy them). And what would blogging from your phone be without getting updates from your phone? Needless to say, they’ve thought of that already, so the primary way to read Twitter (as well as write) is to do it via SMS text messages… although a web interface is also available for those of us that are… “texting challenged”. So if any of that sounds interesting, you can find me under lurobi if you want to friend me. Or I suppose you could find me under the same username if you didn’t want to friend me, but that would be kinda silly wouldn’t it. You guys better friend me, because if I don’t find enough friends that use twitter, I might start militantly recruiting them so my life can be filled with short 140 char messages about random events. I went to meet my friend John at Tonic around 7pm and found him and one of his friends… lets call him Frankie, playing pool in the back room. The place was pretty chill, and mostly filled with the older to why-are-you-still-going-to-bars-youre-so-old crowd, most of whom were watching either the Spurs game or the Cowboys game on one of the many televisions in the place. The night started out fine with a couple of games of pool and a few drinks. Frankie started to become more and more withdrawn from John’s and my conversation, and I think he spent his spare time getting more drinks. As the night wore on, the older crowd left … presumably to go to bed by their 9pm bed times, and was replaced by a much younger (more attractive) crowd. At this point we moved our operation from the back room up to the bar so we could chat up the girls and listen to the band. By now Frankie was pretty drunk and sullen. One of the girls I was sitting next to and talking with had put her keys up on the bar, and wasn’t watching them too closely. Frankie thought it would be funny to slide her keys over behind his glass and see how long it took her notice. He kind of grinned at me when he did it, so I watched for a minute or two before it was clear she wouldn’t notice anytime soon, and then he put them back. I went out to dance around to the rock band playing on stage. John had somehow managed to befriend the band before they got up to play, so every once in a while he would dance on up to the stage and do silly things with the band. Pretty soon that same girl that was sitting next to me came up to me with her friends and asked if I had seen her keys. I figured Frankie had gotten to them again, so I told them to follow me as I looked for Frankie. We found Frankie by the bathrooms, and the girls jumped on him like … I don’t know, girls without keys I guess. Amidst his yells that he “didn’t have no ones *#&$ keys” they fished them out of his pockets, spun around to me and said “we are kicking him out”. I grabbed Frankie and headed for John who was dancing the night away on stage. I whispered to John “Frankie is getting kicked out, lets go”. Frankie is still enraged that the girls think he stole their keys, so John catches on pretty quick and we try to lead him out of the bar. I get one glance back at the girls talking to the barkeep who talks to a few tough looking bouncer guys, who all start staring at us and following us out to the parking lot. We get half way to John’s car before Frankie starts yelling at the bouncers for his right to stay at the bar and how he just found some keys on the floor and blah blah… Pretty soon John and I try to physically drag Frankie to his car, who has now developed a strong pride for some black belt he has in Judokarateboxing or something, and thinks he can beat up everyone in the bar. John and I are taking turns holding him back for about 3 seconds before we get shoved aside by 200lb Frankie. Pretty soon the bar sends out the mother of all bouncers, He is round like a bowling ball, and has to weigh 400lb, with a bald head and a big long beard. A bowling ball who rides a Harley judging from his black leather jacket with metal studs. But Mr. BowlingBall is also a smooth talker, and gets Frankie to back down after talking to him nicely and telling him that the cops are already on their way here. Finally we manage to get Frankie into the car, only to have him jump out and charge for the entrance to the bar before getting tackled by John and me. After a little more talking Frankie gets in John’s car and John drives him home. I hung around the bar a little while longer to make sure Frankie didn’t come back like he was threatening to. When John came back and assured me that Frankie wasn’t going anywhere and had calmed down, we decided to see if we could catch the rest of the band’s show… Only to find (cue dramatic music) we had been banned from the bar for a few weeks! and that is how I solved the case of the missing keys! Good news everyone! 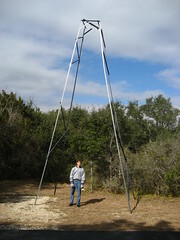 After 3 days of planning, building, lifting, repairing and finally lowering, we managed to fix our pump! Water is again flowing to the Robison house, and in time for out News years party too! My mom’s birthday is new years eve, which is also the birthday of a long time family friend about her age as well, so when New Year’s rolls around we always end up planning a party and having lots of people over. This year it was at our house, and about 8 families came plus some kids our age for a total of around 30 people. 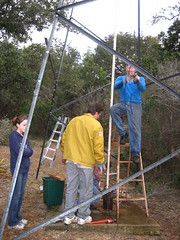 We had a a great time, but didn’t end up setting up any firecrackers, since its been a pretty dry winter in San Antonio. In fact, I drove over to our old friends the Ramos’ during the night to say hi at their party, and on my way back I had to jump out of my car to help some people beat a grass fire away from an abandoned house! The next day I could see that the fire had burned about 2 acres around the house, but we stopped it about 10 feet away from the foundation. I noticed many charred spots around town in the days following New Years, the biggest was probably 20 Acres of solid black charred grass. It must have been quite a sight when it was on fire. When I wasn’t working on water derricks or hosting parties at our house, I could generally be found out with friends around town. I went out to Shisha’s quite a few times with Eric and Matt, visited the Flying Saucer Bar once (still the best beer bar I’ve been to yet), and even met one of my old ITSA friends at a place called Tonic. Now, the night at Tonic was quite a story in it self, with mystery, intrigue (which is really just the same as mystery right? ), and 400 pound bouncers. I call it “The Case of the Missing Keys”.